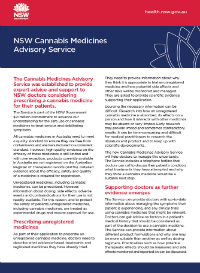 The NSW Government-funded NSW Cannabis Medicines Advisory Service provides free clinical guidance and advice to NSW medical practitioners considering prescribing a cannabis medicine for their patient. This includes both specialists and general practitioners, as well as other health practitioners and services including pharmacists, nurses, pain clinics and clinical trials. The Service was launched in January 2018 and is headquartered in Newcastle within Hunter New England Health to ensure access to expert clinical advice for both metropolitan and regional practitioners, including those based in rural and remote areas. Senior pharmacists, a clinical pharmacologist, and administration officer staff the Service. You are a NSW medical practitioner treating a patient in cross-border areas of NSW. The NSW Cannabis Medicines Advisory Service will be closed from Friday 19 April 2019 (Good Friday) to Friday 26 April 2019. NSW Health will continue to process applications to prescribe S8 cannabis medicines as usual on business days (excluding public holidays) during this period.